Suppose you want to improve the accuracy of a machine used to print logos on sports jerseys. The logo placement has an inherently high variability, but the horizontal alignment of the machine can be adjusted. The operator agrees to pay for a costly adjustment if you can establish a nonzero mean horizontal displacement in either direction with high confidence. You have 150 jerseys at your disposal to measure, and you want to determine your chances of a significant result (power) by using a one-sample test with a two-sided . You decide that 8 mm is the smallest displacement worth addressing. Hence, you will assume a true mean of 8 in the power computation. Experience indicates that the standard deviation is about 40. Default values for the TEST=, DIST=, ALPHA=, NULLMEAN=, and SIDES= options specify a two-sided test for a mean of 0, assuming a normal distribution with a significance level of = 0.05. Figure 68.1 shows the output. The power is about 0.68. In other words, there is about a 2/3 chance that the test will produce a significant result demonstrating the machine’s average off-center displacement. This probability depends on the assumptions for the mean and standard deviation. The new mean and standard deviation values are specified by using the MEAN= and STDDEV= options in the ONESAMPLEMEANS statement. The PLOT statement with X=N produces a plot with sample size on the X axis. (The result parameter, in this case the power, is always plotted on the other axis.) The MIN= and MAX= options in the PLOT statement determine the sample size range. Figure 68.2 shows the output, and Figure 68.3 shows the plot. The power ranges from about 0.23 to 0.98 for a sample size of 150 depending on the mean and standard deviation. 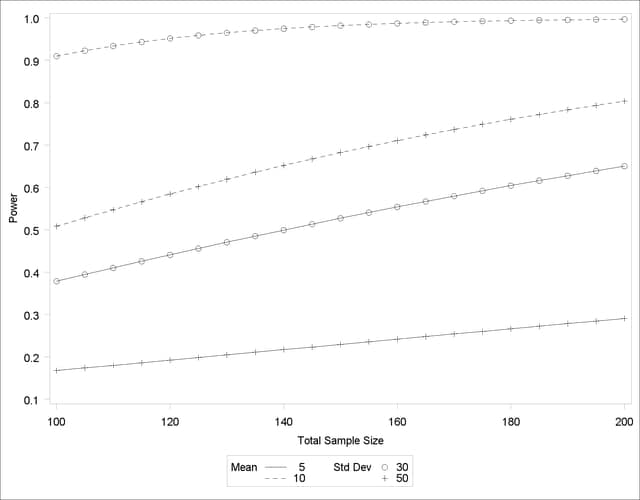 In Figure 68.3, the line style identifies the mean, and the plotting symbol identifies the standard deviation. The locations of plotting symbols indicate computed powers; the curves are linear interpolations of these points. The plot suggests sufficient power for a mean of 10 and standard deviation of 30 (for any of the sample sizes) but insufficient power for the other three scenarios.